I was prepared this time. I had a list. Yup, a list of restaurants we could visit after softball. No scrambling for ideas or trying to navigate Urbanspoon or Yelp! on my Galaxy. But wait. I got an email from Yen Izakaya during the softball game indicating that they had just opened up where Soul Izakaya used to be. Well, we were near Richmond and most were in favour of Japanese food... Bear, being Japanese, hated the former Soul Izakaya for its lack of authenticity. 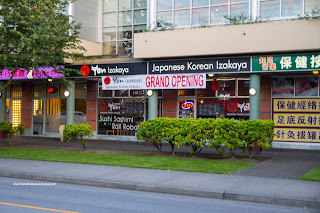 Well, notice that "Japanese Korean Izakaya" for all to see on their front signage. With that in mind, we weren't shocked to see Korean food on the menu. Authentic izakaya? Nope, and really, they weren't hiding the fact either. 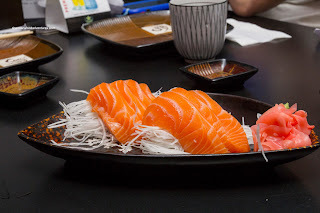 We ended up starting with an order of Salmon Sashimi. It looked alright and tasted okay as well. But it was a bit soft for our liking. 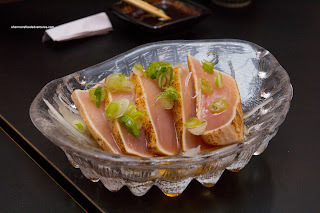 On the other hand, the Tuna Tataki was the complete opposite. Generally, this dish features delicate tuna with a lightly seared exterior. Yes, the outside was indeed lightly seared, but it was strangely rubbery. Nothing particularly amiss with the rest of the tuna though. Moreover, the dressing was tart and appetizing. 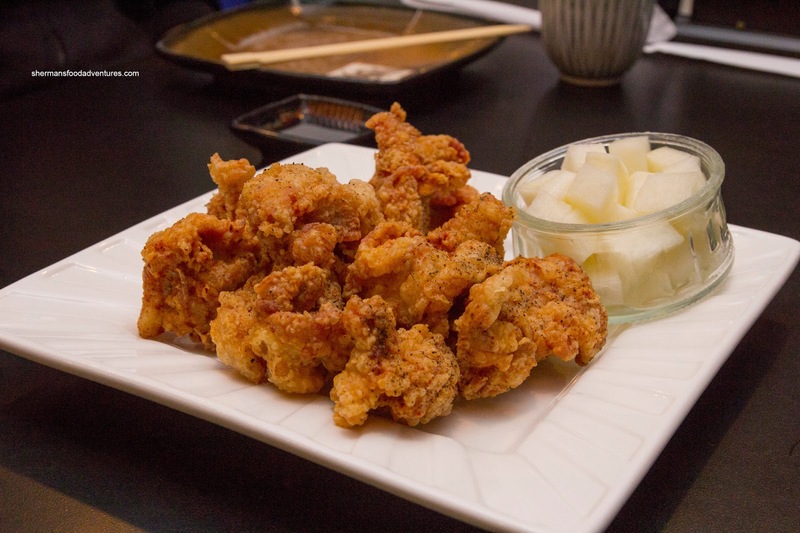 Next up was a trio of their fried chicken offerings starting with the Soy Fried Chicken. Since it was tossed in a mildly sweet soy sauce, the chicken wasn't as crispy as it appeared. However, it was juicy and moist on the inside. As mentioned, the soy was not particularly strong. 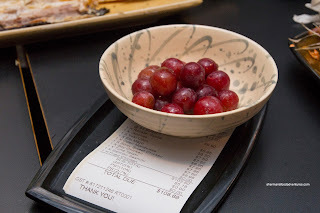 It was mostly sweet with only the mildest of savoury elements. The Sweet & Spicy Fried Chicken was exactly as advertised being sweet and spicy. I wouldn't classify it as really spicy, but it definitely had a kick. It was more sweet than spicy though. Naturally, with all that sauce, there was no crispiness left. 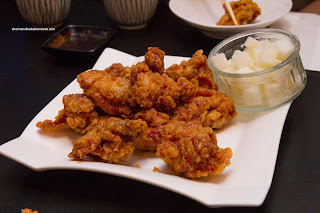 Finally, we had the plain Fried Chicken and it was predictably crunchier. We found the seasoning to be light with only a hint of pepper. Since Gyoza King decided to join us for eats, it was only natural to order a couple of orders of the Pork Gyoza. Um... 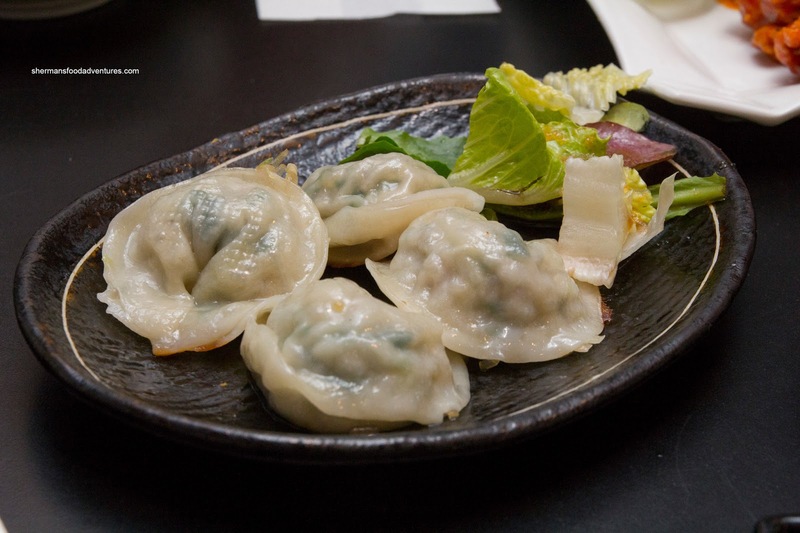 These were the strangest looking gyozas we'd ever seen. Oh right, we were in a "Japanese Korean Izakaya". 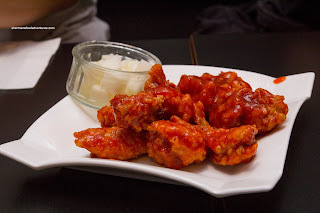 So these were really pan-fried Korean mandus. If we looked at them in that respect, they were pretty good where the pork and glass noodles added a nice texture. The good amount of greens brought brightness and flavour while the dumpling wrapper was super thin. Good mandu, not a gyoza though. 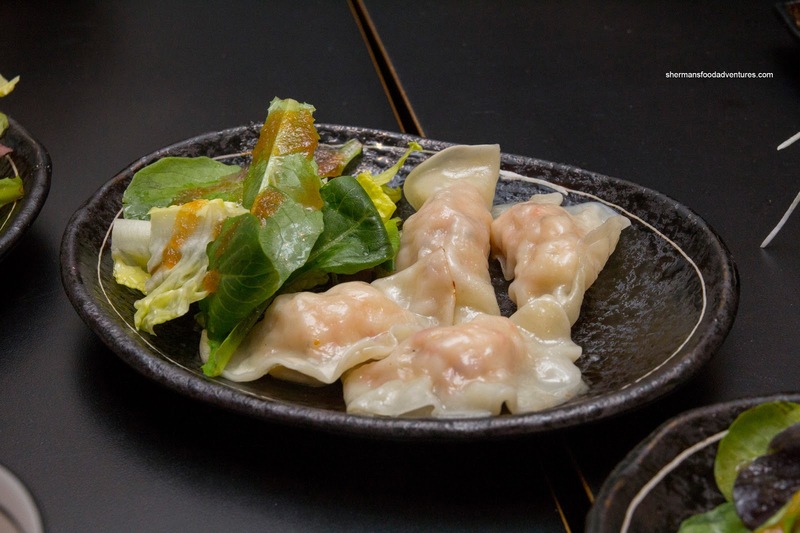 We also decided to try the Lobster Gyoza (Robster Gyoza on the menu... Were these stolen or something?) as well. Again, these were more like lobster wontons than gyozas. In that case, they were good with properly cooked sweet lobster with the same thin wrapper. Again, not Japanese gyozas. Bear loves Short Ribs, so I encouraged him to order 2 portions because one would be for him and the other for the rest of us. 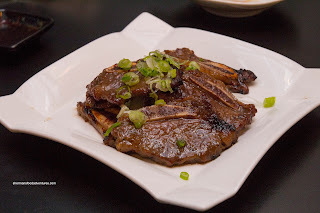 The short ribs were pretty good being meaty with a minimal amount of fat. They were tender, yet retaining a good chew (not over tenderized). Naturally, they were quite sweet, but not overly so. The sugars caramelized so there was a depth-of-flavour. 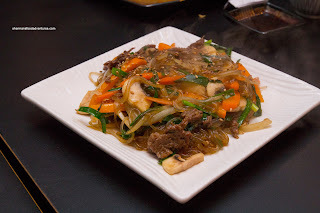 Continuing on the Korean theme, we had the Japchae which was a decent portion for the price. There was a good noodle-to-ingredient ratio where the beef was moist and well-marinated. The noodles themselves were chewy and flavourful. Of note, the japchae at our other table (we split into 2) was not nearly as good as ours. We tried some maki sushi with the Dragon Roll. 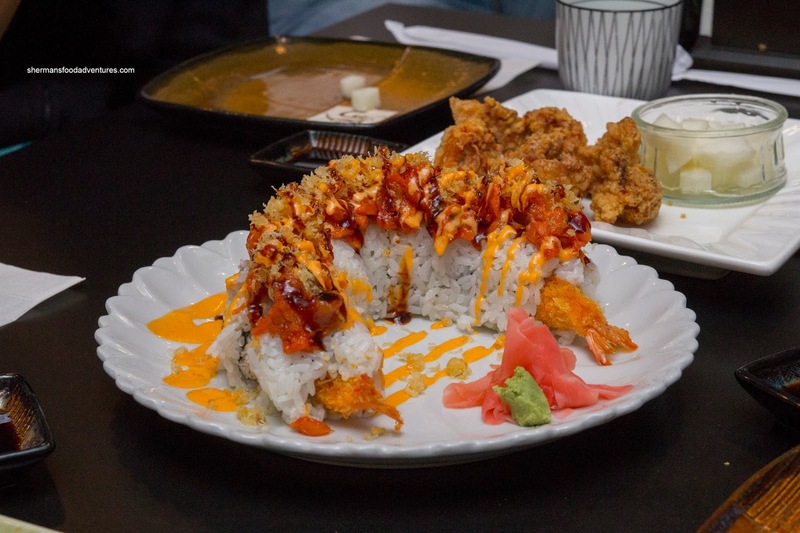 It consisted of essentially a dynamite roll in the inside with spicy tuna and tempura bits on top. 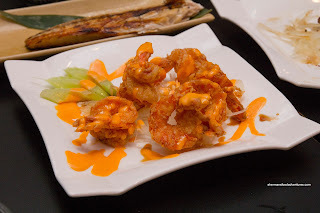 The ebi tempura was smoking hot. So much so, it made the rice around it quite warm. The rice was decently chewy while the overall flavour profile of the roll was sweet and spicy. There were good textures, especially the crunch for the ebi. The same couldn't be said for the Ebi Mayo though. I'm sorry folks, but this was not an ebi mayo. I don't care if they are fusion or whatever they call themselves, this was not good. The prawns were fried far too long and did not have enough batter to keep the moisture. It resembled more like a Chinese fried prawn. The mayo dressing was more like a spicy aioli where there was a dire need for more sweet mayo. Moving onto a better dish, we had the Saba which was a pretty large portion. Although it was missing the head and strangely presented with the bone side up, the flesh was moist, flaky and well-seasoned. Shockingly, this was one of the better versions we've had of late. Our last dish was an order of the Yakiudon. We felt that the whole dish was a bit too wet and overly sweet. 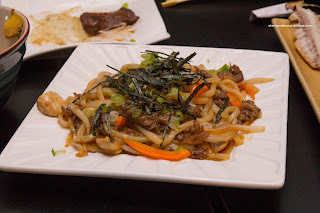 However, the beef was moist, veggies vibrant and the noodles were chewy. As we were finishing up, we had differing opinions about the place. Dark Helmet thought this meal warranted another visit back while Bear vehemently disagreed. For me, I would like to be a fence-sitter as there were some good dishes to go with the sub-par. 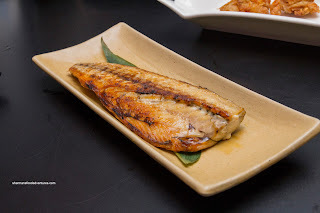 I am willing to give them a pass on the unauthentic dishes because they do boldly advertise on the outside they are not a solely Japanese Izakaya. Besides, what I have noticed from all the Izakayas in Richmond is that they tend to blend several different cuisines that appeal to the locals. I guess you can't fault them for that.